— The Psychology and Body Language of Poker. Tells that redefined how professional poker players win! Often, it’s as if your opponents had turned their cards face up on the table! Finally! Actual video of poker’s most profitable tells in motion. Free bonus book included: ✓ Caro on Gambling. 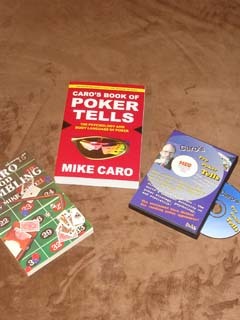 Mike Caro’s poker tell training can pay for itself very quickly. How quickly? Well, if you play middle limits or higher, just getting one tell right can be worth more than the price of this combo. Find out why so many thousands of serious poker players rely on Mike Caro’s advice. It’s an amazing Poker1 combo for players serious about making money at poker, using Mike Caro’s acclaimed methods for reading opponents.